MARI-SOL Collection by Vondom offers many Tables for Professionals: Bars, Hotels, Restaurants... Very functional, they are suitable for both Indoor and Outdoor use. Their clean design will please your guests. High Quality Furniture, made in Spain, Europe. 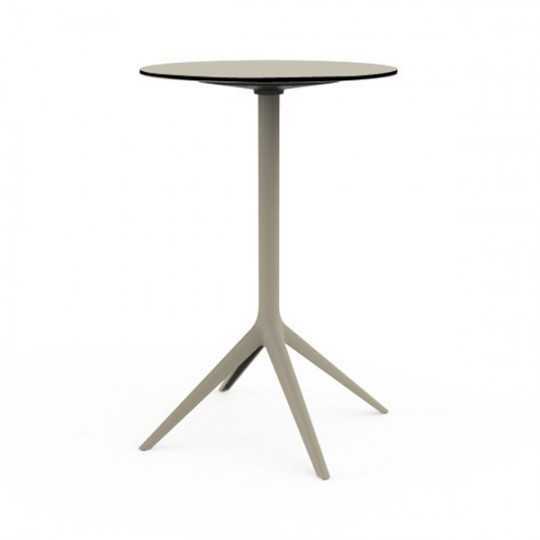 MARI-SOL Restaurant Table with Double 4-Leg Base is available in 10 colors. Ideal for Hotels, Bars, Restaurants... Highly resistant, this contemporary design Restaurant Table is suitable for both Indoor and Outdoor use. Indeed, it is perfect for a terrace, garden, patio... Designed and manufactured in Europe. MARI-SOL Folding Restaurant Table has a Double Tripod Base and a Collapsible Table Top. Very functional, it is ideal for Hotels, Bars, Restaurants... Highly resistant, this contemporary design Restaurant Table is suitable for both Indoor and Outdoor use. Indeed, it is perfect for a terrace, garden, patio... Designed and manufactured in Europe. MARI-SOL Double 3 Restaurant Table is available in 10 colors. Ideal for Hotels, Bars, Restaurants... Highly resistant, this contemporary design Restaurant Table is suitable for both Indoor and Outdoor use. Indeed, it is perfect for a terrace, garden, patio... Designed and manufactured in Europe. MARI-SOL Terrace Table with Square Glass Table Top and 4 Legs is available in 10 colors. The Square Tempered Glass Table Top is available in 3 sizes. Highly resistant, this contemporary design Square Dining Table can be installed inside or on a terrace, garden, patio... Designed and manufactured in Europe. Set of 2 tables. MARI-SOL 4-Leg Square Dining Table for Professionals is available in 3 sizes and 10 colors. Ideal for Hotels, Bars, Restaurants... Highly resistant, this contemporary design Square Restaurant Table is suitable for both Indoor and Outdoor use. Indeed, it is perfect for a terrace, garden, patio... Designed and manufactured in Europe. Set of 2 tables. MARI-SOL Indoor and Outdoor Square Side Table with 4 Legs is aimed to be used by Professionals. It is available is 3 sizes and 10 colors. Ideal for Hotels, Bars, Restaurants... Highly resistant, this contemporary design Square Glass Coffee Table can be installed inside or on a terrace, garden, patio... Designed and manufactured in Europe. Set of 2 tables. MARI-SOL 4-Leg Square Side Table for Professionals is available is 3 sizes and 10 colors. Ideal for Hotels, Bars, Restaurants... Highly resistant, this contemporary design Square Coffee Table is suitable for both Indoor and Outdoor use. Indeed, it is perfect for a terrace, garden, patio... Designed and manufactured in Europe. Set of 2 tables.